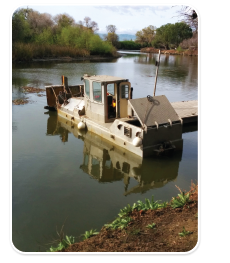 At Waterworks Industries, Inc. we understand the need for a variety of options when implementing aquatic vegetation control programs. 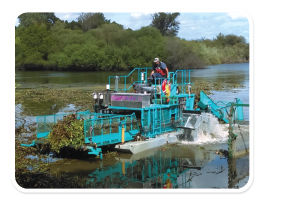 The use of mechanical vegetation removal can be the ideal method in instances where alternative control methods are not working, irrigation restrictions prevent the use of herbicides, or aquatic vegetation growth has reached a threshold where removing biomass is the most beneficial option. At Waterworks Industries, Inc. we have a division dedicated to this control method. 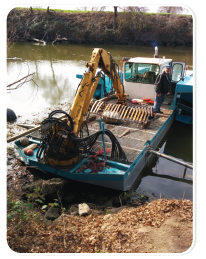 We use our fleet of mechanical vegetation removal equipment which includes aquatic harvesters, cookie cutters, aquamogs, shoreline and trailer conveyors, excavators, and other specialty and support equipment to mechanically remove nuisance growths of submerged, floating, and emergent vegetation. A few of the many benefits you can receive from mechanically removing vegetation from your system include access to immediate open areas of water and reduction of organic sludge and nutrient buildup through biomass removal.